Glenn Tachiyama has updated his popular Trail Running Calendar for 2008, and I would highly recommend it for any trail runners left on your holiday gift to do list. I have enjoyed the 2007 calendar all year with Glenn's fabulous photography and the dates of major ultras marked down to remind me to check results pages. As was the case last year, proceeds from the calendar will go to the Washington Trails Association, a non-profit that creates and maintains trails in the State of Washington. Buy three of more calendars from ZombieRunner, and you can even get a free pair of Dirty Girl gaiters! You can click to the order page here. Uses: Plastering on the wall of your office (or outhouse) your walls so you can dream wistfully of the trails while going about your business. Features: Good looking trail runner dudes, dudesses, volunteers, rocks, roots, streams, mud, mountains and a dog. 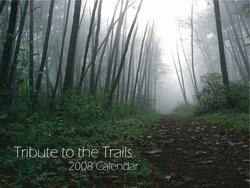 Why you should get it: It really is a nice calendar and proceeds go towards trail maintenance projects. Wow...my first calendar review! Thanks Paul for the glowing review! LOL! Thanks also to SD and many others for spreading the word! Even though there's bound to be overlap, it does make a difference because everyone has unique readers and the more people that know about our project, the more it'll benefit the trails. Sales are going VERY WELL and we just sent Zombie the last of our supply. So, thanks everyone for supporting our fundraiser and I hope you enjoy the calendar!